All flashings of whatever description should be of soft (roofing temper) copper sheets. Such copper is peculiarly suitable for this use for it is easily worked and shaped and stands up well under temperature stresses. There is no place in flashing — or counter-flashing — where soft (R. T.) sheets will not serve better than hard (C. T.) copper. The latter, being comparatively hard, does not lend itself so readily to shaping on the job. The softer the copper the easier it is worked and shaped and the more readily it adjusts itself to changes in size caused by expansion and contraction. For the opposite reason the material of all shaped gutters, eaves trough, drips, water-bars, leaders, cornices, etc., should be hard (cornice temper) copper. Its stiffness is necessary to maintain the shape, especially against ice and snow loads. As most shapes are of mill-manufacture the process is such that the chance of fracture at the bends is minimized. In fact, all manufacturers of gutters, leaders, etc., make them of hard (C. T.) copper, because experiment and experience have proved their practicability. To this general rule there are two exceptions, gutter-linings and cornice ornaments. These should be of soft (R. T.) copper. Gutter-linings in gutters of any length are peculiarly subject to temperature stresses. The continual warping to which the sheets are subjected soon fatigues hard (C. T.) sheets, and cracks develop at the bends. The use of a softer sheet overcomes this cause of failure. For ornaments which are stamped from dies soft (R. T.) copper is superior to hard (C. T.), for the former works more easily and is less liable to fracture. Copper sheets are made in all weights and gages up to one-quarter inch, thicknesses greater than which are usually classed as plates or slabs. It is generally defined by the ounce weight per square foot; that is, "16-ounce copper" means copper weighing 16 ounces or one pound per square foot. Experience has proven that 16-ounce copper sheet is the ideal flashing weight. Under special conditions, such as unusual exposures to wind or snow, this weight may well be increased. Some architects will specify nothing lighter than 18-ounce material. On roofs with heavy tiles or slates 20-ounce is advisable, for a lighter metal is too easily cut by the heavy roofing. Flashings lighter than 16-ounce are undesirable. Sixteen-ounce copper is 0.0216 of an inch thick; 14-ounce is less than 2/100s of an inch, and is easily punctured by heels, etc. All rain water carries with it off the roof dust and grit particles, which have some wearing effect on the gutter. It becomes wisdom to use metal thick enough to do the work of leading off the water for a period of time at least as long as the life of the building. Sixteen-ounce copper will stand up under these conditions; fourteen-ounce is too light. Built-in flashings of closed valleys, when the flashing is itself protected by the roof covering, might, with a light form of roofing, be of metal lighter than 16-ounce, but as a matter of good practice it is recommended that nothing lighter than 16-ounce be used for flashings, gutters and leaders. 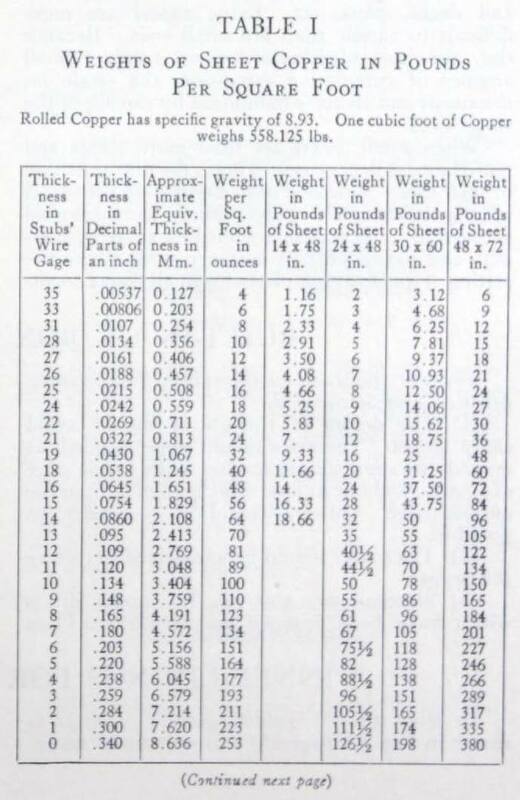 Weights of sheet copper in pounds per square foot.